" Articles from: February 2011	"
"This is not a budget issue," the policeman speaking to the cheering protesters jammed inside of the capital rotunda in Madison, WI, shouted this weekend, "This is a civil rights issue!" Hannah Giles: James O'Keefe Did It, Not Me! The story quoted below, detailing Hannah Giles' attorneys tossing Rightwing hoaxster James O'Keefe "under the bus," comes from San Diego City Beat this week. 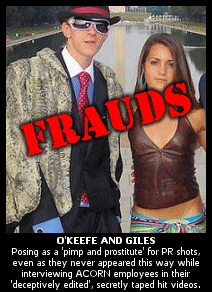 Please note, however, that SD City Beat's Dave Maass is still, unfortunately, misleading readers by incorrectly reporting that O'Keefe played Giles' "fake pimp partner" or that he ever "pos[ed] as a pimp" in the scam video tapes featuring deceptively and "severely edited" secretly-recorded interviews with ACORN employees. The scene last night, as the Republicans in the Wisconsin Assembly suddenly, and without warning --- quite literally in the middle of the night --- announced and took a vote on Gov. 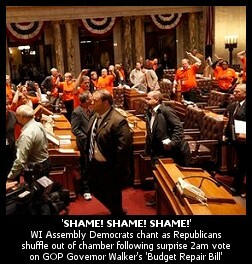 Scott Walker's union-busting "Budget Repair Bill," followed by chants of "Shame! Shame! Shame!" from Democrats inside the chamber after it passed was remarkable. As it was happening, I was reminded of all of those "Tea Partiers" last year who, despite a full year of committee hearings in both chambers of the U.S. Congress, mark-ups, negotiations, changes and concessions in hopes of bringing Republicans on board with the health care insurance reform bill that had otherwise been discussed and debated for at least a full year prior as well during the Presidential campaign, complained that the bill had been "crammed down the throats" of the American people in defiance of popular protests. Well, in case you're wondering, Tea Partiers, this is what cramming a bill down throats in defiance of popular protests actually looks like. This is also what it looks like when Big Government actually votes to take away freedoms from American citizens --- the other matter you folks pretended to once care about during the Health Care bill debate. So why aren't you joining with the protesters in Wisconsin now? MADISON, Wisc. --- The debate in the Assembly appeared to be a few hours away from ending when Speaker Pro Tem Bill Kramer interrupted their speeches and called the vote. It was gaveled in with lightning speed, less than the standard 15 seconds --- it was so fast that 28 members did not even vote on it, some out of protest but some failing to reach their buzzers. There were 51 ayes and 17 nays, and the nays included Republicans Dean Kaufert, Lee Nerison, Richard Spanbauer, and Travis Tranel. Democrats exploded as soon as the vote was called, yelling "Cowards!" and "Shame!" at the Republicans filing out of the room. The bill moves to the Senate, which cannot take it up until and unless 14 missing Democrats return. In a short speech to protesters, Democratic Rep. Cory Mason joked that he was "never so happy that we have two chambers." We previously covered the WI protests by highlighting Rachel Maddow's analysis of the Walker/GOP bill in which she framed the debate as "Billionaires vs. Bake Sales: an existential fight for the survival of the Democratic Party" due to the legislation's blatant goal of busting the state's public unions in hopes of being the first domino to destroy the unions in full, in advance of the 2012 election. A full two days after The BRAD BLOG exclusively broke the story of allegations by Yvonne Smith Segars, the chief of the New Jersey Public Defender's office, charging Gov. 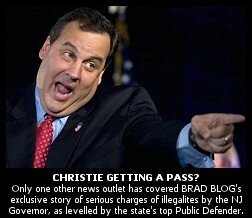 Chris Christie with "bullying tactics" and violations of state law, as well as both the NJ and U.S. Constitutions, in trying to muscle her out of office and inappropriately attempting to take over hiring there, a NJ newspaper has finally covered the story as well. It is the only one to do so, so far, to our knowledge. [T]he issue isn’t Segars. The issue isn’t jobs Christie can’t fill because Democrats won’t confirm his nominations. The issue is the independence and integrity of an office that stands between the power of the state and the powerlessness of the poor. Other than Braun's report today, and our own from Tuesday, there appears to be virtually no coverage of this story anywhere else, even as it seems to be a very important one --- particularly given the seriousness of the charges leveled by Segars in the letter she sent to the Governor on Monday (linked in our original report); the fact that her attorney has gone on record calling the matter a "power grab," comparing Christie to a "king" who has "tampered with the independence of the judiciary and...the Public Defender" meriting impeachment by the state legislature; and especially as it involves allegations of strong-arming and potential law-breaking by a quickly-rising GOP superstar said to be a future Presidential contender. But, then again, he's a Republican. 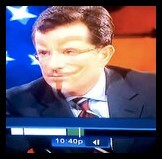 So, there ya go. Nothing to see here? Knock, knock, New York Times! Anybody still covering actual news in your NJ Bureau next door? UPDATE: It seems the Philadelphia Inquirer also picked up the story today in it's South Jersey News section (though it did not appear in our Google News search, for some reason). Unlike the Inquirer or the Star-Ledger, the online NJ politics outlet PolitickerNJ had the courtesy of crediting us for the scoop in their coverage yesterday by editor Darryl R. Isherwood. 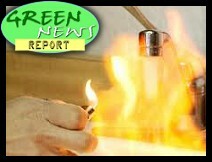 IN TODAY'S RADIO REPORT: Oil prices spike on Libya unrest; Gettin' gassy at the Oscars; Hidden costs of coal; Air pollution deadlier than cocaine ... PLUS: Unrest in the Midwest, powered by Koch (the Billionaire Koch Brothers, that is) ... All that and more in today's Green News Report! Will Chris Christie, New Jersey's tough Republican Governor and rising GOP star, be the next president of the United States? That prospect is much less likely if the accusations of Yvonne Smith Segars, the head of New Jersey's Office of the Public Defender, turn out to be accurate. In a scathing letter [PDF] sent to the Governor on Monday, she charged Christie with having "violated New Jersey law as well as the State and Federal Constitutions," in his efforts to remove her from her post, and by interfering with the operation of her office. In the letter, Segars threatened to sue him for eroding the constitutional rights of indigent clients. She says he's actively undermining the work of the state's public defenders by "obstructing...management decisions and by impeding the filling of constitutionally mandated positions." 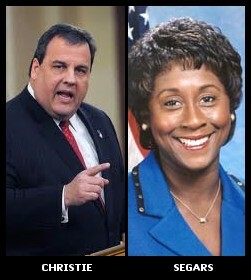 Segars accused Christie of "bullying tactics" in an effort to remove her from office. The tactics, according to NJ's chief Public Defender, included "veiled threats", "pressure to resign", "interference with [the] agency's operations" by thwarting approved promotions, and ordering her press officer to report to the Governor, instead of to her. Segars adds that she "now fear[s] being physically removed from my office." If the accusations are true, this and other unpopular actions could well serve to help unravel future political ambitions for Christie, who is regarded as a rising star among the "Tea Party" and right-wing base of the Republican party. 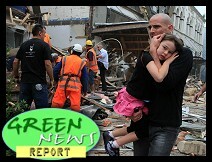 IN TODAY'S RADIO REPORT: Deadly earthquake in New Zealand; Aging dams at risk in the U.S.; 50 million environmental refugees by 2020, and other cheerful news from America's scientists ... PLUS: The WI gov's attack on labor and renewable energy, brought to you by the Billionaire Koch Brothers ... All that and more in today's Green News Report! If we have learned anything from WikiLeaks, it's that we must consider the words emerging from the mouths of our political elites as the equivalent to a magician's sleight-of-hand. During the transition between the Bush and Obama administrations, an astute observer could gain far greater insight on the direction of the new administration by ignoring the then President-elect's lofty rhetoric and focusing instead upon the fact that he chose the Wall Street-connected Larwrence Summers and Timothy Geithner, as opposed to Paul Krugman and Joseph Stiglitz, to serve as his chief financial advisers. Today, Egypt remains in the midst of a genuine, yet to be completed, democratic revolution. So far, it has produced the resignation of President Hosni Mubarak and a dissolution of Egypt's parliament. 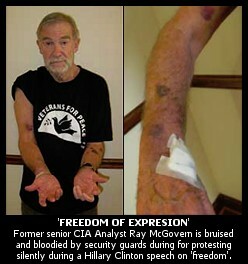 However, it has not, as yet, led to real "regime change". Mubarak's hand-picked cabinet remains. So does Vice President Omar Suleiman, whom a May 14, 2007 U.S. Diplomatic cable referred to as "Mubarak's consigliere," and whom Middle East expert Lisa Hajjar refers to as "Egypt's Torturer-in-Chief". Egypt and the world --- and, indeed, the several other Middle Eastern nation's now seeing similar popular uprisings --- would do well to ignore public remarks by the U.S. President and Secretary of State to the effect that they supported the democratic aspirations of the Egyptian demonstrators and an end to the Mubarak presidency. While their public condemnations of violence against the press and the Egyptian people were appropriate, their reported behind-the-scene effort to have Suleiman lead a "so-called" transitional government speaks volumes. If you're ready to join such a fight, we're quite certain there are tens of thousands of freedom-loving Americans now rallying in Madison, Wisconsin this week who would welcome you in that fight. 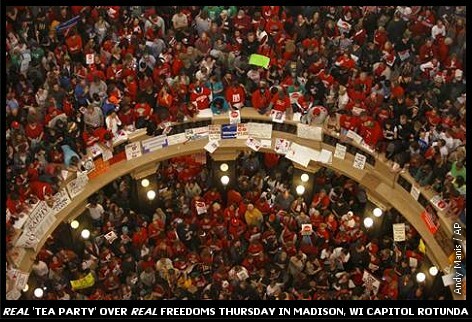 For those just joining this extraordinary story in Madison (which also seems to be spreading to other states, like Ohio, where their new Republican governor is also attempting to legislate away the freedom for citizens to collectively bargain with their employers), MSNBC's Ed Schultz, who was on the ground in WI yesterday, has offered the most comprehensive coverage from the start of the still-growing fight for the rights of teachers, fire-fighters and other public employees to collectively bargain for themselves. But it was Rachel Maddow who may have put things in the best perspective last night, as she offered a persuasive case as to how the purported claims of new Republican Gov. Scott Walker, and the new Republican majority in the state legislature, weren't really about responding to a "budget crisis" --- one that appears to have been "manufactured" by them, in fact --- but rather, a brazen attempt to break the backs of Democrats, via the unions which often support them, prior to the upcoming 2012 election. "What's happening in Wisconsin right now is not about a budget. This is about elections. This about the Republican Party going after the institutions that make it possible for Democrats to win elections in America," said Maddow in her report last night (video posted below). What's happening in Wisconsin right now is about Republicans versus Democrats. It's about elections. We saw the same thing with ACORN. Remember the Rightwing jihad against ACORN? What did ACORN do to earn that?," she asked before answering her own question. 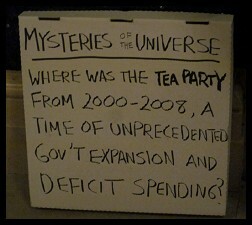 "Well, ACORN for years registered huge numbers of minority voters and poor voters. Minority voters and poor voters overwhelmingly vote Democratic when they vote. "There were not any real problems with the way ACORN registered people. This whole 'ACORN voter fraud epidemic' was essentially made up out of whole cloth. The only problem with ACORN and its voter registration program is that they were really good at it! And that helped Democrats," she argued. "ACORN was not a Democratic organization, but ACORN's work was very politically beneficial to the Democratic Party and so therefore the Right decided that ACORN had to be destroyed." Unions, she then went on to argue, who are similarly not Democratic organizations, but whose well organized, often well funded work tends to help Democrats in elections and --- especially, since Citizens United --- now remain largely the only thing between Republicans with their enormous corporate benefactors and the chances for Democrats to win elections anywhere. 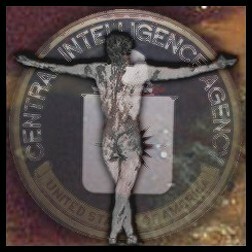 "The only institutions of any size, with any heft at all on the liberal side, are the unions. So, of course, they too, must be destroyed." "If you break the public-sector unions in Wisconsin, then you can break them anywhere. And if you break them everywhere, then it is 'Bake sales versus Billionaires' for not only this next election, but for every election here on out. 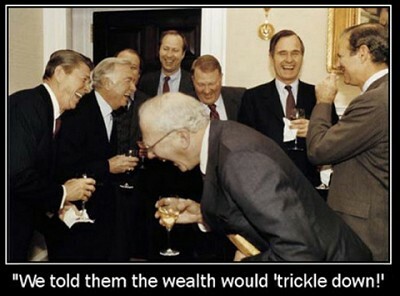 Republicans run the table. Bake sales on one side, billionaires on the other. That's it."